The precise origins of geometry are lost to history, but they go back at least 2400 years, when an unknown mathematician devised the first geometrical demonstration. This was long before Euclid of Alexandria gathered all the geometrical knowledge of his age and arranged it systematically, but Euclid’s work would reveal the implications of this early discovery. His vision of a geometrical universe transformed the way westerners conceived of themselves, their capabilities, and their relationship to the world. It demonstrated that humans, through the power of reason, could obtain a deep understanding of the world they inhabit, and establish it with incontestable certainty. Scholars in all disciplines tried to emulate the geometrical method and match its standard of truth and certainty, a pursuit which would ultimately lead to modern science. And not only scholars and scientists were impressed with the unmatched power of geometry: in the coming centuries artists would recast their practice to accord with the lessons of geometry, rulers would attempt to base their rule on the certainties of geometry, bureaucrats would construct geometrically-ordered state apparatuses, and reformers would rely on the universal principles of geometry to radically re-envision western society. Proof! 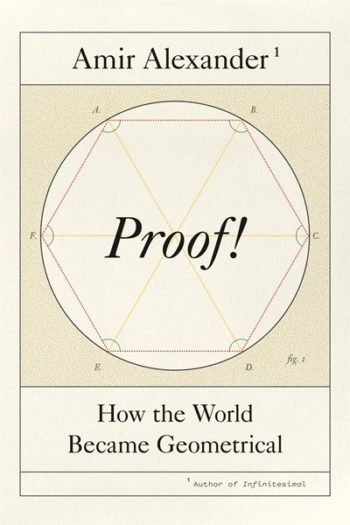 : How the World Became Geometrical is the story of how geometry shaped western civilization, and, in fact, made it possible. The novel assumption that the world was geometrical transformed the arts, and then led directly to the Scientific Revolution. The notion that the role of science is to reveal the world’s hidden geometrical structure has been key to scientific developments from Galileo’s time to our own. And as classic geometry evolved into analytic geometry and then the calculus, ever more complex and flexible patterns were revealed in the natural world. The human world too took on new shapes inspired by the certainties of geometry, ranging from the centralized absolutist state to egalitarian democracies. Most fundamentally, the ideals of universal rights and freedoms, which are the very core of western thought and politics, are founded on the assumption of a geometrical world in a uniform geometrical space.